I was going to post only illustrations this week. However, this has been such a long Michigan winter I couldn't resist posting this photo instead. 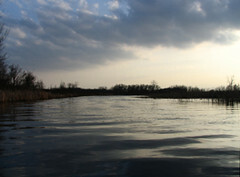 I took it the evening of 3/30 on Portage River near Y Ave. in Vicksburg. It's official, kayak season has begun. Finally. Ironically, this photo looks really peacefull and serene. I gotta tell you it was crazy noisy paddling around. Grackles, Canada geese, red wing black birds, spring peepers and robins were all chirping, sqwaking, glurping and honking at once. I had to go home to get some peace and quiet. Nature sure is tricky sometimes. It beckons you to partake in it's beauty. Then it sends the ants to ruin the picnics, bees to get in your pop cans, rednecks to shoot at your floatable intertubes. You can tell its spring - kayaking and ice cream. Bring it on!